At the first sign of cold weather, my mouth begins to water for fall foods. Cinnamon, roasted beets, fresh pomegranate and kumquats. Fresh apples everywhere, and so many winter squash… just last night, I had a pizza topped with butternuts and Brussels sprouts (and it was delicious!). Desserts in our house get a little more rustic when the cold weather arrives. Light, berry-filled pastries give way to silky butternut squash pie, plums brûlée, and sheet cake filled with chopped apples, topped with creamy frosting. This recipe, from Williams-Sonoma, is pretty darn easy to whip up, and made with ingredients most of us have on hand. If you’re out of buttermilk, make your own using whole milk and lemon juice, and put your harvest of apples to good use. 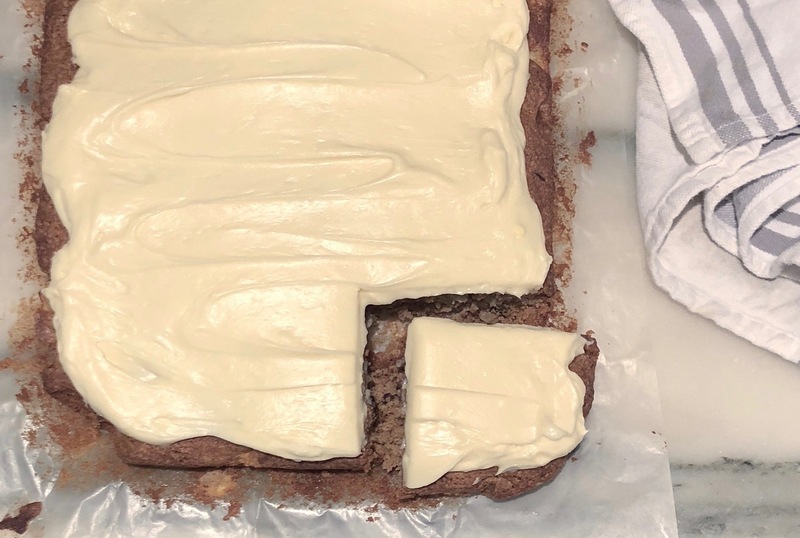 I like to substitute pecans for the walnuts, and leave the cake as simple as is suggested- pan form, parchment paper, and a generous helping of cream cheese frosting.